Israel beefed up its tank and artillery deployment on the Golan Heights frontier with Syria on Sunday, cautioning Damascus' forces to keep a distance as they sweep rebel-held areas over the border. Backed by Russia, Syrian President Bashar al-Assad launched an offensive last month to regain the southwestern Deraa region, driving thousands of refugees toward neighboring Jordan and Israel. 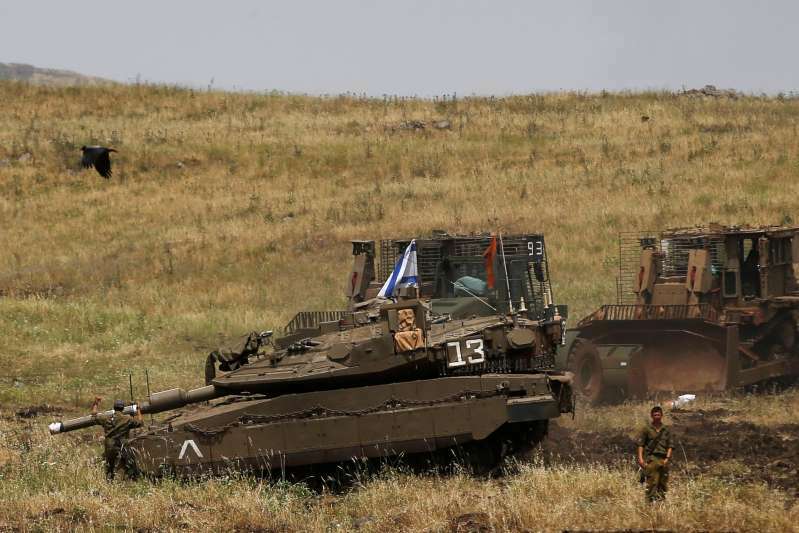 Israel's military deployed tank and artillery reinforcements to the Golan on Sunday, a statement said, "in light of developments on the Syrian Golan Heights". In its statement the military said Israel was holding to its non-intervention policy. Israel says it is neutral in the seven-year war but has carried out scores of air strikes in Syria on suspected Iranian targets, Lebanese Hezbollah guerrillas or in response to what it said were attacks directed against its own forces in the Golan. Addressing the Israeli cabinet, Prime Minister Benjamin Netanyahu said Israel had apprised Russia and the United States of its position on the developments in the Golan, alluding to a separation of forces agreement with Syria after the 1973 Middle East war that created a buffer zone patrolled by the U.N. Disengagement and Observer Force (UNDOF). "We will continue protecting our borders, we will provide humanitarian aid to the full extent possible, we will not allow entry into our territory and we will demand strict adherence to the 1974 disengagement deals with the Syrian army," he said. Israel seized much of the Golan from Syria in the 1967 war and annexed the strategic plateau, a move not recognized abroad. Citing the Syrian instability, Israel has sought U.S. endorsement for its claim of sovereignty over the Golan. A senior Netanyahu cabinet minister said in May the Trump administration could soon oblige. Washington has not commented on the matter. A report in March on UNDOF activities said Syria's armed forces maintained positions in the Golan which violated the accord, as did Israel's deployment to the area of 155 mm artillery, Iron Dome anti-missile systems and related equipment. Since 2016, Israeli forces have provided humanitarian aid to Syrian villagers and internally displaced refugees across the Golan in a bid to keep the frontier quiet. The military says it has stepped up aid in recent days as people fleeing Syria have been arriving at a clip of hundreds a day and now number in the thousands. An Israeli army officer in charge of humanitarian efforts on the Golan said on Sunday that several thousand Syrians displaced by the Deraa fighting had sought refuge in villages and tent camps set up by international relief workers on the frontier. "I imagine that (they) assume that they are far less likely to get shelled. I imagine that they do not see what happened to them in Deraa or in Aleppo or in the Damascus suburbs happening to them close to the Israeli border," the officer, a lieutenant-colonel who declined to be named, told Reuters. Asked how Israel might respond if the Syrian army were to carry out strikes near the border, the Israeli officer described such a scenario as unlikely. "I imagine that, in such a situation, our commanders would assess the incident and decide on an appropriate response," he said.